Roulette is a one of a kind game when you’re at the casino. It’s a table game like blackjack and craps, yes, but it also has the fun interaction of watching the wheel constantly spinning, and the little silver ball trying to make its mind up which number it is going to land on. Playing online roulette can be just as fun as playing at a brick and mortar casino, but there are certainly some things that you will want to consider before you begin playing with real money. There are a lot of free casino roulette games out there, but there’s nothing quite like putting your own money at risk and watching your bankroll multiply. And if you play this game right, there is a lot of potential for big profits. Roulette is a pretty basic game, despite the fact that there are a lot of betting choices. If you’re playing American roulette, there are 36 numbers to choose from, plus 0 and 00. European roulette is pretty much the same, except there’s only one 0–which actually pushes the odds slightly more into the gambler’s favor. Still, the basic game is the same; you put your chips onto the squares on the board, and if a number hits that fits your bet, you win the appropriate money. This could be as easy as putting your money on black 13 and the ball lands on 13, or you could your money on the middle column, black, and odd, all three of which bets would actually be winners if the same 13 hits. The payouts for the different bets vary a bit–the harder the bet is mathematically to win, the more it pays. Roulette is a really fun game, and there is a lot of potential for making a lot of money with it since a straight number bet pays 35-1. However, these bets do not hit often, so there is also potential for losses, as with all casino games. Practicing with a free account might be a good idea until you feel like you have mastered the basic strategy of the game. One popular method of playing roulette involves a betting structure called the Martingale System. There are some major problems with this for a couple reasons, but you can modify it a little bit when you are playing online with decent results. This system involves doubling your bet every time you lose a 1-1 payout bet until you win, and then reset back to the base minimum bet. Now, in a true 50/50 chance situation, with no limit and an infinite bankroll, this would eventually secure you a profit. But casinos know about this, so they have taken safeguards to prevent it from happening. For starters, a seemingly 50/50 bet like black/red does not truly have a 50 percent chance of winning because of the presence of 0 and 00. So there’s actually a slightly less than 50 percent chance that this bet will win for you, nullifying the effects of the Martingale System. Also, it is quite common to see a swing of eight or more red numbers to hit in a row. Is it really worth risking $128 to win just $1? This is why tables have bet limits, too. Since if you do find yourself on a downswing, the amount you need to bet to make a tiny profit can become pretty big. Roulette is a fast paced game, and because it requires very little math to formulate a good strategy, it is a perfect game to play on your mobile device. Playing at an online mobile casino is easier today than ever before thanks to the huge number of smart phones and tablets that are out on the market right now. And as long as you have a good casino that you play at, they should have a mobile app for you to play roulette on. Some casinos even have a web based platform for you to use, although in some instances you might find that this option moves a tiny bit slower. 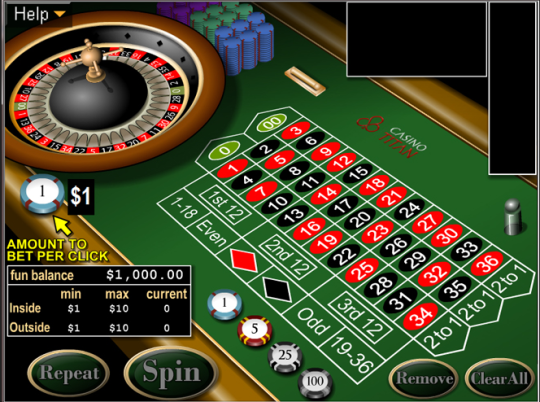 Regardless of how you play online roulette, you want to make sure that the casino you play at has top notch software. There are several really good software platform providers that supply gaming technology to the majority of online casinos. Some of the major ones include RTG, Rival, Cryptologic, and Playtech. Not all of the casinos that offer these software platforms accept U.S. players, so check this out before you create an account.